Be the first to share your favorite memory, photo or story of Lyda. This memorial page is dedicated for family, friends and future generations to celebrate the life of their loved one. Lyda White Fields, 97, the widow of Woodrow Fields, passed away Thursday, April 4, 2019 in Georgetown, Kentucky. She was born January 24, 1922 in Bourbon County Kentucky to the late Toney and Grace Reed White. 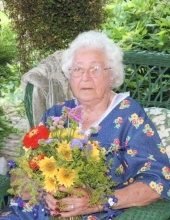 Lyda was from a family of four brothers and seven sisters. Lyda is survived by her grandson Ricky Hedges, great grandson, Dillion Hedges, great great grandson, Levi Hedges, step daughters, Fannee Hilander and Mary Anne Collins, step granddaughter Crystal Renee' Mays and nephew Alfred White. She is also survived by her special friends, Dr. Gus Bynum, Michael Ford, Mildred Sue Hammons, Rick Wilhoite , Harlan Rutledge and the family of Castbey Clay. She was preceded in death by her daughter Martha Vermillion. Lyda's visitation will be 11 to 1, Tuesday, April 9, 2019 with a 1pm Service at Tucker, Yocum & Wilson Funeral Home. To send flowers or a remembrance gift to the family of Lyda White Fields, please visit our Tribute Store. "Email Address" would like to share the life celebration of Lyda White Fields. Click on the "link" to go to share a favorite memory or leave a condolence message for the family.